Tava tea is a slimming tea which sticks out even among the many tea choices as a great drink with a wide variety of natural healthy benefits. From an amazing abundance of anti-oxidants to potential fat fighting properties, it’s not hard to see how this drink has gained popularity, but what’s the real story behind all the claims for Tava tea? Just What Are Tava Teas? Even if you’re a fan of traditional green and black tea, it’s possible this might be the first time you’ve heard about Tava. That’s not surprising considering that unlike black tea, white tea, or green tea, Tava isn’t from one plant or type of tea leaf – but it’s actually a blend that focuses on giving you the best combination of various tea leaves to specifically target weight loss and fat loss. Where Can I Buy Tava Tea? This can be a little bit trickier of a process to figure out. First, if you can’t find it in a local health food store (and make sure to look for it under similar names like “Tava green tea” – it’s the same thing) then you may want to look for a local natural health and supplement store. Barring that, there are many online options such as Tavatea.net so you can have it delivered directly. Finding a local store is possible, but it’s also going to be more of a challenge based on where you live. If you’re not comfortable ordering online, you always have the option of visiting your favorite wellness center or natural health store and asking them to order some for you. What Are The Benefits of Tava Tea? Tava tea ingredients are blended to encourage weight loss, so that’s an instant plus for individuals who are looking for a dietary benefit. In addition to this, the tea also offers the anti-oxidants that have made this drink such a staple of healthy eating and living the past few decades. The antioxidant effects of tea just create a healthier overall body to begin with, while this blend also encourages metabolism and encourages your body to burn more calories, especially fat calories. 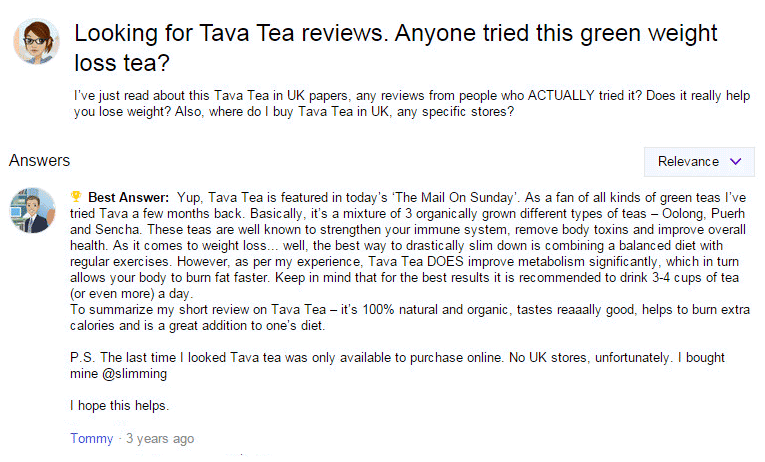 With that being said, it’s important to understand that Tava tea for weight loss is no magic bullet. 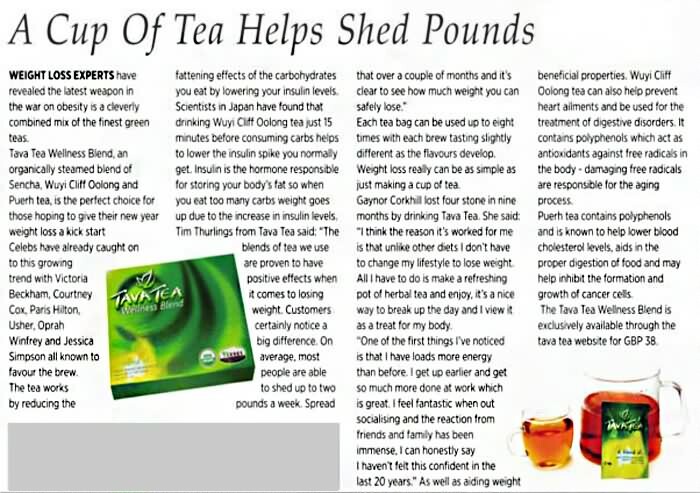 There are also several claims that say Tava is the best metabolism booster of all the teas, with some claiming it might be up to twice as effective as the ever popular green tea in that regard. A smart diet and exercise program still must be part of any long term weight loss efforts. Tea alone, no matter how good, won’t be enough to speed up massive and permanent weight loss. 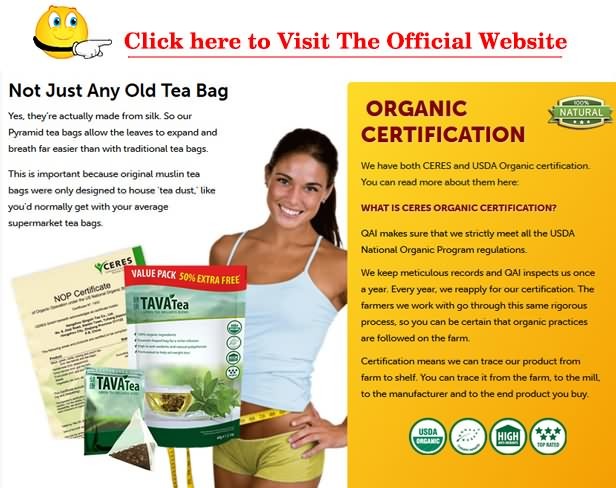 When you’re looking for reliable Tava tea testimonials, it’s important to check the source and make sure it’s a reliable one. That being said, there are a wide variety of websites displaying a wide range of reviews for this product. The reviews generally seem to be positive, with a lot of people crediting this weight loss tea as being an important “jump start” that really helped them out in getting the hard results. Some people even referred to this drink as a “plateau breaker,” something anyone who has struggled with weight loss on a diet before will appreciate. Are There Any Side Effects of Tava Tea? One of the nice things about going with natural herbs or drinks is that generally there’s a lot less to worry about than there would be if going with a hard drug or other pharmaceutical option. The two things to watch out for are insulin and caffeine. This tea helps slow the rate of insulin production, which isn’t a bad thing for most people but diabetics and others with insulin issues need to be very careful before charging forward. The other factor with Tava, which is also an issue with most types of tea, is that there are very high doses of caffeine. What does this mean? Well for people who have heart issues, are hugely overweight, or have a strong sensitivity to caffeine, it’s something that needs to be watched out for. 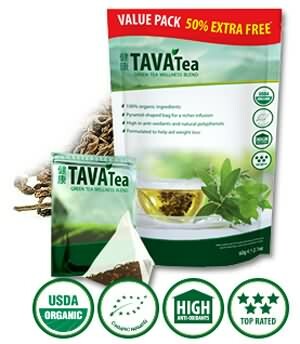 What Ingredients Are In Tava Tea? This is a difficult question to answer, but the short answer is it’s a combination of vitamins and various teas blended together. The ingredients are organic and natural in nature, and the blend simply allows them to draw out the best that various types of tea have to offer and deliver it into one convenient package. When it comes to tea and health or tea and weight loss, there’s no question that there are strong connections between these topics. Adding tea to your daily diet will help encourage any weight loss efforts you’re taking as well as provide a wide array of health benefits that are impossible to ignore. It’s one of the easiest small changes you can make to quickly look, feel, and be better!